You have all heard the propaganda saying that test scores in DC have improved tremendously ever since the citizens lost the right to vote for their school board, and after foundations like the Broad, Arnold, Walton and Gates family fortunes took over. The editorial staff of the Washington Post never tires of repeating this line. If you’ve been following this series of blogs on the latest (2017) NAEP scores for DC and elsewhere, you have found no evidence of that. In this last installment on this topic, I finally found a group of students who DID see their scores rise under mayoral control. White fourth-grade students in math. The highest-scoring group of white students in the entire nation (that I can find scores for) actually improved their scores when the citizens of DC lost democratic control of the school board. But no other group did. Here is what I mean: the dotted lines are for African-American fourth graders in math. From 2000 through 2007 (just 7 years) their scores went up from 188 to 209, which is an increase of 21 points (or 3 points per year). However, from 2007 through 2017, their scores went from 209 to 224, which is 15 points (or 1.5 points per year). Or, if you only count students enrolled in DC public schools (and not the charter or private schools) fom 2003 through 2007, their scores went from 202 to 209, which is 7 points in 4 years, or 1.75 points per year. From 2007 through 2017, their scores went from 209 to 218, which is a rise of 9 points in 10 years, which means 0.9 points per year. Clearly, mayoral control did NOT mean improved increases for black fourth grade math students in DC – using the standard national yardstick. Once again, we see that Hispanic students at the fourth grade level in DC were making bigger improvements in math BEFORE mayoral control than they were after Mayor Fenty got that power. Yup: to those who have much already, even more has been given. I’m pretty sure that Perry Stein of the Washington Post will not reprint these graphs. How about Valerie Strauss? Progress Perhaps With 8th Grade White Students in DC on NAEP After Mayoral Control? I continue working my way through the various subgroups in DC and elsewhere, trying to see if the imposition of mayoral control back in 2007 has been a success or a failure. This post has to do with white (Caucasian) students in DC and elsewhere in the US. Here you will notice that the scores for European-American (white) students in DC are quite a bit higher than those of similar origins elsewhere in the US. For that, the explanation is relatively simple. Washington, DC is rather unique among large American cities in that virtually all of its white working class citizens moved out to the suburbs and later to the exurbs several decades ago. Even if white students in DC don’t live in luxury and wealth, a very large fraction of them have parents with graduate or professional degrees and more books around the house than the average American household — and so my own kids, who went through DCPS from K through 12, are and were quite different from the children of carpenters or mechanics that I grew up with in far Montgomery County, MD, sixty years ago. The reason that there are so many blanks in the table is that the number of white students in DC used to be so small that the statisticians at NCES could not draw valid conclusions. (My own kids graduated before 2000). Again, this chart does not show any real signs of success for Mayoral control in DC, or for the entire ‘reform’ agenda which was supposed to revolutionize American education. Maybe there was progress with Hispanic students in DC and elsewhere? Continuing to look at 8th grade NAEP reading scores, I now concentrate on those for Hispanic students in DC and elsewhere in the nation. Here is the graph and the raw data, which I and other cobbled together by using the NCES website and the NAEP data explorer, and also from what I gleaned at the presentation at the National Press Club building on 14th St NW last week. Here, it is possible to see slight changes: NAEP reading scores for Hispanic 8th graders in DC are actually a bit LOWER than they were before mayoral control. Not better. My Panel Discussion: Has Ed Rhee-form in DC Been A Success? Recently I chaired a televised panel discussion on the legacy of eliminating democratic local control over public education in Washington, DC and turning it over to the mayor and his/her chancellor. We looked at the National Academies report on the results of that major change, and found that the results were rather dismaying. Mary Levy, an independent analyst of education finance and policy. The show aired several times on DC Channel 8 is airing on www.dctv.org or DCTV (Comcast channels 95 & 96, RCN channels 10 & 11, Verizon FiOS 10, 11, & 28). Watching the hour-long discussion will give you an opportunity to hear some people who have been laboring in the trenches to try to improve public education in Washington, DC, and who have been ignored, or opposed, or worse by the powers that have run DC public education for a long, long time. Many thanks to Willie Brewer for organizing this and helping with the filming and production, and to my guests for tolerating my very first attempt at leading this sort of panel discussion. I think all of the panelists did a great job. Let me point out that two of them (Mary Levy and Thomas Byrd) were specifically thanked by the authors of the report (on page ix) for being among the 13 official reviewers thereof. Thus, they know what they are talking about. 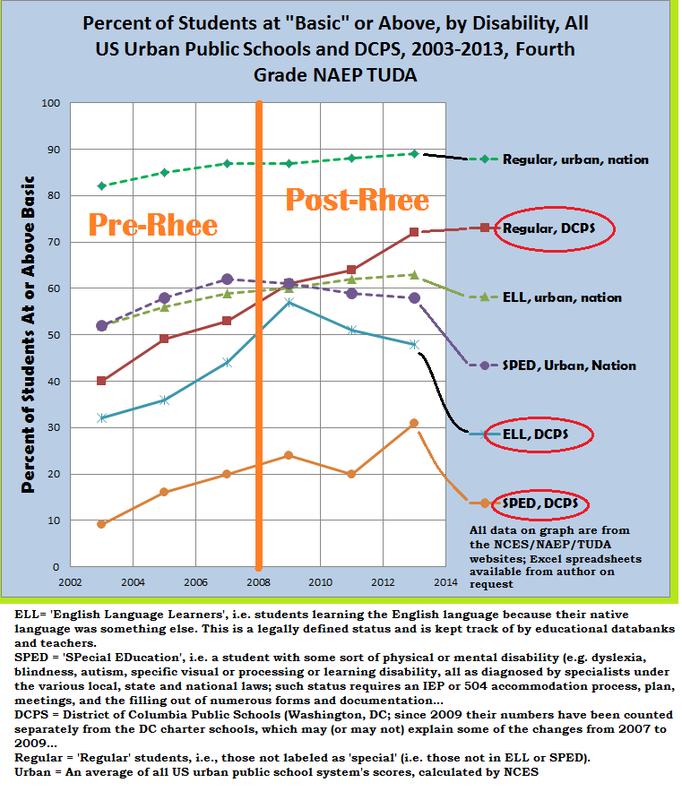 If you actually read the text of the National Academies report on the results of what is often called educational Rhee-form in Washington, DC, you will find over and over again language indicating that the data was simply unavailable to the reviewers, which is sad, considering that Michelle Rhee, our first Chancellor, said that she was always driven by data. Also: after many, many millions of dollars were spent on devising new accountability schemes for teachers, driving many of them to retire early, and turning the education of 45% of the students in DC over to charter schools (dozens of which have failed and closed), there has been no improvement in closing the gap between affluent white students and their less-affluent black and brown peers. PS: (12-25-15) I gave the wrong channel before, and I thank Willie Brewer for notifying me. Also, I was told that the Youtube link for some reason was ‘private’; I hope it has now been fixed. Please let me know if you can or cannot see it. In the past few posts, (#1, #2, #3) I’ve merely cut-and-pasted graphs or text that the National Center for Educational Statistics (NCES) published two days ago on their website as part of what has become a very widespread, longitudinal survey of statistics illustrating educational progress or problems in the large urban school systems of the USA; this one was called the NAEP TUDA. The only modifications I did to the graphs were cutting out the ‘fine print’ that few of my readers would look at anyway, and adding some notations and color for clarity. This time, I actually lifted a few digital fingers and asked the NCES web site to produce some simple tables of longitudinal and cross-sectional data for DCPS and a few other cities. Nothing complicated: I just wanted to see how black, white, and Hispanic students have been faring, along with those in special education and immigrant kids learning English for the first time, compared with ‘regular’ kids, and compared with tbejr counterparts among alloother large public urban school systems. Then I had Excel plot the data. Here are my first two such graphs, exploring whether mayoral control of schools (and all that went along with that, such as eliminating tenure and turning education over to private corporations) helped or hurt. I think the results are obvious. Lots of information in this first graph, but you have to pay a little attention. (1) Notice how high white students in DCPS score on this graph (solid red line, at the top). Those students, some of whose siblings I’ve taught at Alice Deal JHS/MS, are the highest-scoring subgroup that I know of in the entire NAEP/NCES/TUDA database. Overall, they continue to do well, and in the fourth grade, for math, the only departure from a straight-line trend was 2007. Their rate of growth in test scores exceeds that of white kids in all urban public school systems, probably because white kids in DC overwhelmingly come from professional, educated families. We don’t have any trailer parks or other sizable population of white working-class kids in DC, ever since the massive “white flight” of the 1960s. (You have to go elsewhere to find characters like those on “Honey Boo Boo”!) 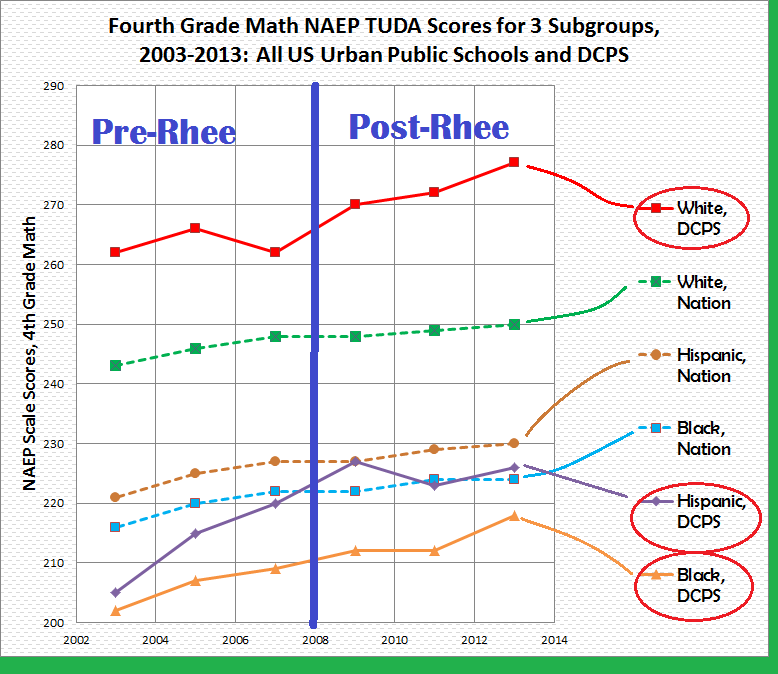 In any case, overall, no real change pre-Rhee to post-Rhee, other than the fact (not apparent in this graph) that the proportion of white students at most grades has vastly increased in DCPS: in a word, because of gentrification. In any case, white kids in DC continue to score a lot higher in 4th grade NAEP math than white kids in other public urban school systems (dotted green line near the top). (2) Among Hispanic students, it appears that the trends after 2008 in DCPS for fourth-grade math students aren’t so favorable to the pro-mayoral-control side of the argument: from 2003 through 2009, their scores were increasing at a pretty amazing rate (solid purple line) until they matched the scores of Hispanic students in all US urban school systems (dotted purple line). After that year, those scores went down or leveled off. Again, no miracle. (3) Among black students at this grade level, if the trends for 2003-2007 had continued, the bottom orange line for black 4th-graders in math would be a bit higher than it is now, largely because there was in fact no growth from 2009 to 2011. (4) It’s a bit harder to see, but the hispanic-white and black-white achievement gaps at this grade level continues to be a lot larger in DC than it is in the nation’s urban school systems. Twice as wide, in fact. So, again, no sign of success. Overall: no evidence here whatsoever of any of the promised miracles. In fact, if anything, growth was a little worse, overall, after Rhee, than it was before Rhee. Now let’s look at achievement levels for 4th grade math students with disabilities (ie special education), ELLs (English Language Learners) and those in regular education, both here in DC and in all US urban public school systems. Here, I chose to plot the percentages of students who are “Basic” or above, rather than the average scale score. You could plot scale scores yourself, if you like. Notice that most of these lines show an overall upward trend for this period. The top line (dotted, green) is the percent of all public-school, regular-education students in urban public school systems who score “Basic” or above on the fourth-grade math NAEP. The solid, maroon/brown line represents the same measurement for regular 4th-grade math students here in DC. Notice that both the dotted green and solid brown lines are going up pretty steadily, with no particular change in trend on either side of the vertical orange line. Which means that mayoral control seems not to have changed to past trends one way or the other. The olive-colored, dotted line represents percentages of fourth-grade students of English as a second language in all of our urban public schools. As you can see, the trend is a slow but steady increase. However, in DC public schools, since 2009, the corresponding line (solid, sky blue) is trending downwards. Why? I have no idea, but it’s not a favorable argument for continued mayoral control, since before Fenty and Rhee took over DCPS, the trend was certainly upwards. With special education students, I used a dotted purple line for all national urban public school students, and a solid orange lines for those in DC public schools. I have no idea why the percentage of 4th-grade math students scoring “Basic” or above went down across the nation’s cities after 2008, while it had been going up modestly but steadily before that date. Clearly, the trends in special-education scores in DCPS are even more mysterious: a continuation of past trends in 2009, a fairly large drop in 2011, and a fairly large increase in 2013. In any case, if you were to extrapolate the orange pre-Rhee line past the central line, I suspect you’d come to about the same place we are in right now (2013). Again, this is evidence that all the churn, upheaval, anguish, money, and curriculum impoverishment of the past 6 years in the District of Columbia has all been for naught. We would have gotten the same results with the system we had in place beforehand. My conclusion: any progress in DCPS appears to be a continuation of trends that show up very clearly as going back ten years, well before the DC city council, with the blessing of Congress, abolished the school board and handed control of the public schools over to a chancellor appointed and responsible to a mayor.